MP-10 Pro, CD/DVD Player from Korg. Korg has introduced the MP-10 Pro Professional Media Player—a musical companion for mobile entertainers, solo keyboardists, singers, and amateur musicians. As a media player, the MP-10 Pro features two independent media song players; each is able to play both MP3 and MIDI files (.mid, .mid+G, .kar, .xf, .mp3 + lyrics, .mp3+G) directly from the 120GB internal hard drive. 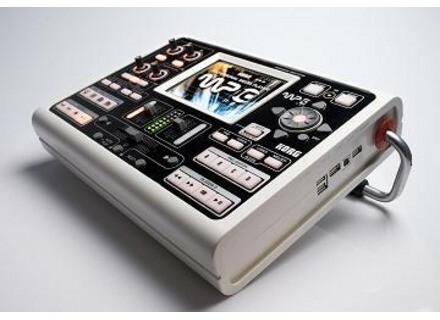 The motorized 60mm crossfader allows creative DJ-style mixing, the company says. Songs can be saved into multiple playlists, and the database can be sorted using any criteria. Playlists can be imported, or even created "on the fly." The Browser gives an immediate view of everything available in the selected genre. Using the Find function, the MP-10 Pro will carefully search the entire database for the user's favorite song. Once found, the song can be immediately sent to either of the two players. As a MIDI instrument, the MP-10 Pro can play MIDI files from the song players. The internal sound engine uses the same EDS (Enhanced Definition Synthesis) found in the Korg Pa500 arranger keyboard and can also be played from an external MIDI device. The front panel offers four assignable performance pads for triggering sound effects and musical phrases. Numerous on-board effects are available for the internal players and MIDI engine. For the entertainer, singer or master of ceremonies, the MP-10 Pro is equipped with a TC Helicon vocal processor offering compression, EQ and delay. A pitch shifter for changing keys, a time stretch function for changing the tempo and an advanced vocal remover allow MP3 files to be customized to suit the entertainer's style. The MP-10 Pro features Korg's TouchView display. In addition to MIDI and USB connections, there are connections for a PC keyboard that make naming and cataloging songs very efficient, according to Korg. Two microphone inputs (one XLR and one 1/4"") are designed to assure compatibility with nearly any mic. The MP-10 Pro will be available July 2010 with pricing TBA. [Musikmesse] Denon DN-F400 D&M Business & Professional Group (Europe) has introduced the second model in the new Denon Professional solid state player series. Numark CDN55 Rackmount Dual CD Player Numark announced the availability of its new CDN55 rack-mount professional dual CD player.